A lot of people seem to think that classic blues licks just sort of fly out of great players, and no one really talks about the fact that those same blues players had to, at some point, take time to work this stuff out. So this is my process, and it works every time, no matter how complex the idea or the chord progression. I can modify it by adding in melodic sequences or other devices, but it’s best to start with just the scale and make it work, first. Same apply to start of song? Wow. MAJOR lightbulb moment. Thanks, Griff. Guess I was finally at the right stage of understanding where the topic just popped & the epiphany just exploded. Within seconds of watching this video, I started just noodling around with the guide tones & timing & everything began to fall into place. I’ve been waiting 55 years for this moment of clarity. Yeah, I’m pretty dense. Try as I might, & I wanted it real badly, it just wouldn’t click. My jazz teacher must’ve felt like he was driving really dull nails into incredibly hard wood. It’s a wonder he has any hair left. I understand how much woodshedding there is to do & that this is just the beginning of seeing the fretboard now as my plaything to dance between chord tones….& the clinker non-tones that make things interesting. Honestly, I’m just sitting here at 3:30am, open mouthed, stunned. I can’t thank you enough for your teaching ability & putting this so succinctly. Good advice Griff. I know you’ve mentioned this many times to us in the past and I hear these sort of things in the music I listen to. It is always good to have you remind us from time to time. Thanks! Griff, Ok Dave asked some of my questions,but I am not sure on the thirds. Is it the third of the chord scale or the third of the chord shape? Or are they the same cause I am not sure on 3,5,7ths etc.. thanks. It’s the 3rd of the chord. You want to aim for the chord tone of the chord you are on. 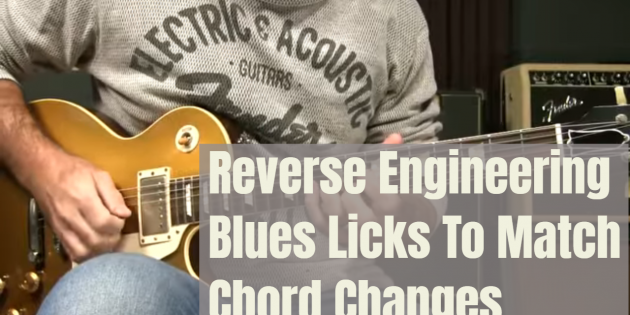 This is a little higher level thinking than just playing the blues scale all the time. It sounds good, but it takes some groundwork and you really have to know your chord shapes so you can envision them. Griff, so if I am doing a lick when the A chord is playing and it then goes to the D chord I should land on the 3rd of the D chord for beat one? Then, when the song goes back to the A chord I should land on the 3rd of A for beat one and finally when the song goes to the E chord I should land on the 3rd of E for beat one? Is my understanding correct? Should you always try to do this between chords? As usual an enlightening lesson! You don’t always have to target the 3rd, but you can. Any chord tone is better than a non-chord tone. Thanks Griff! Great advice, as usual. Your recent blog posts seem to be directly addressing issues I am dealing with! I love it!! Thanks Griff – stuff like this is so valuable for my learning and to make progress.